(PhysOrg.com) -- A mystery that began nearly 2,000 years ago, when Chinese astronomers witnessed what would turn out to be an exploding star in the sky, has been solved. 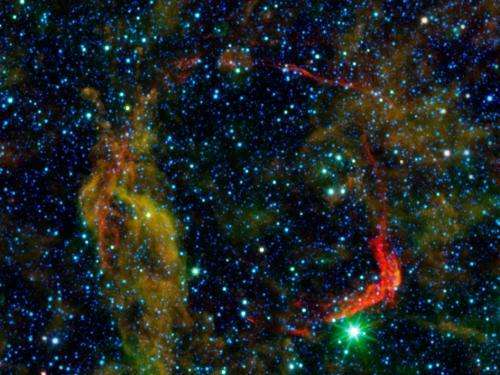 New infrared observations from NASA's Spitzer Space Telescope and Wide-field Infrared Survey Explorer, or WISE, reveal how the first supernova ever recorded occurred and how its shattered remains ultimately spread out to great distances. This was a very cool article. I think we could learn a lot from looking back and RE-examanazing the recorded history of astronomy. OR it could be the Star-ship Enterprise in one of its ventures back in time and in orbit around the earth. Since most space is not empty with all that gas and dust, space travel at near light speeds is not possible--unless done in one of these cavities--any space craft would explode when hitting any of these particles when traveling at such velocities. This is one reason why the Universe could be full of intelligent life without any of them having turned up on our front door (Fermi's paradox). Beautiful photos - the universe is astonishingly beautiful, as well as somewhat frightening. what this article alludes to is that if our current scientific world wide civilization is able to maintain current multi frequency resolution or better astronomy recordings continually for the next 500 years----we will learn an immense amount of information that we could not possibly fathom. we have JUST entered the age of a new ability of recording----an age where because of digital ability to record lots of data, and then organize and compare the data ---a task even more computationally demanding than merely collecting and storing the data....that we will have a basis for a scale of comparisons of historical empirical recording over a period of human generational scale time ....that has never existed for all of humanities existence. "The white dwarf is thought to have later blown up in a supernova after siphoning matter, or fuel, from a nearby star." So we need to add a nearby star, has this been observed or just inferred to get this theory working? "The observations also show for the first time that a white dwarf can create a cavity around it before blowing up in a Type Ia event." So the necessity of a shell for the theory to work is proof the shells existence? the authors must have failed "assumption hiding 101"
The cavity is directly observable, in the history of the gas from the supernova. If there were no cavity, it would be much hotter from the shock waves. Also, the model of type Ia supernovas has evolved a lot in the last few years. 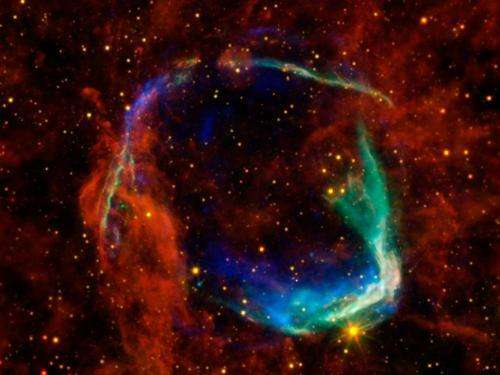 At first, they were just another type of supernova (or subtype to be precise). Now the model requires two stars and two end of life transitions before the final explosion. So over a period of millions of years you could have three supernova events, the final one being a type Ia supernova. First you have a star which goes through a red giant phase, gets rid of its outer layers (possibly picked up by the companion) and the core remains as a white dwarf. Think Sirius A and B. The white dwarf gains mass from its companion especially if the companion also becomes a red giant. (Sirius A hasn't reached this point yet.) When the white dwarf gains enough mass, boom!